June Mar Fajardo had a huge smile on his face. It was his night. He just got the highest individual award in the country’s best basketball league. But the thing that got him to break character of a stoic, mild-mannered giant on the court was the sight of two people being interviewed on a wide-screen TV: his parents, Bonifacio and Marites. 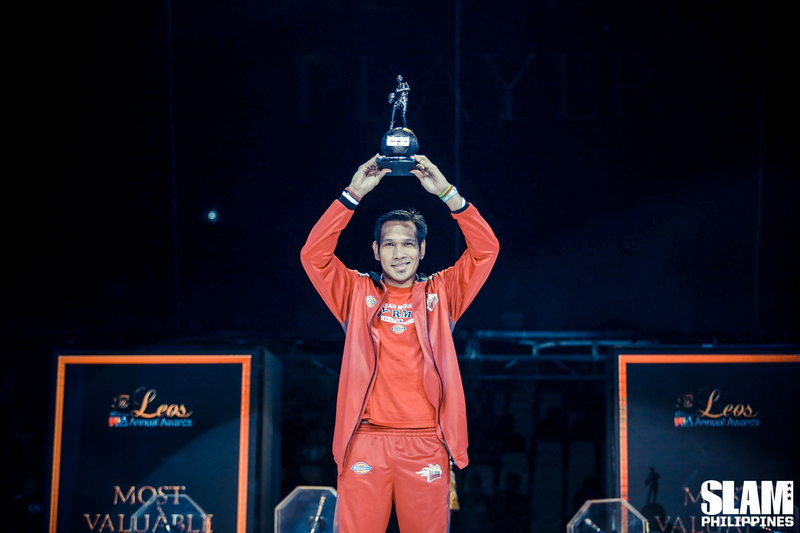 June Mar made history on Sunday by becoming the only PBA player to ever win five Most Valuable Player trophies, yet in true June Mar fashion, he managed to make it not about himself. Just one of his many smooth moves. On his way to talk to media, June Mar made a brief stop in front of the TV to capture a moment bigger than any award he’s received. He whipped out his mobile phone—his gigantic shooting hand shrinking the device to the size of a flash drive—and took a video of his beaming parents on the screen, in the spotlight, basking in the joy of birthing and raising a 6-foot-10 gift to basketball. 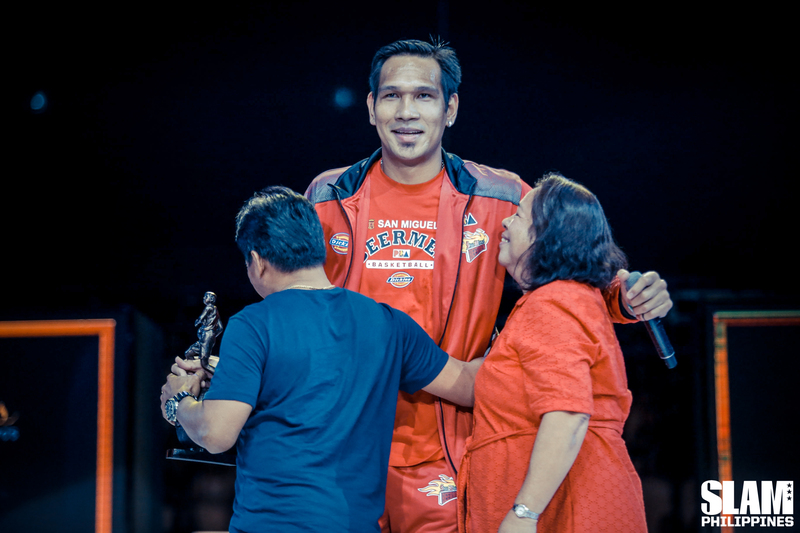 Just minutes ago, June Mar had shared to his parents, or rather dished off, the attention in front of thousands of spectators at the Philippine Arena. Add that to the June Mar highlight reel. “Sila ang dahilan kung bakit ako lumaki ng ganito,” said the usually reserved and tight-lipped San Miguel Beerman as he welcomed Bonifacio and Marites at center stage. Height is the first thing that’s ticked off in every June Mar talk. Six-foot-10 is hard to ignore. And watching him tower over his parents—over the league—it’s still puzzling how he grew into a human aparador with parted hair. Height, as a tool, helped him reach the top. Height, as a punchline, pushed him to get there. A not-joking, healthy, engaged, and triggered June Mar is a 42-20 monster. A chill, okay June Mar is an automatic 20-10. An injured June Mar is fair game for everyone else. This is a good system. June Mar is sheer dominance unless his shin or his ankle (the one on his feet, not the one in Cebu) say otherwise. June Mar is simply good vibes. Watching him work at the post releases endorphins. Listening to his postgame interviews releases more. Because, really, how can you hate on June Mar? Because he’s too tall? Because he’s not from Manila? Because you don’t like his hair? Because he’s teammates with Arwind Santos? Because he just put your favorite player in the spin cycle? Because he stole your favorite player’s MVP trophy? June Mar, five times and counting, is the MVP we need. Maybe we just don’t know it yet. We’re breathing in the June Mar era, and the air doesn’t sting. He’s not being shoved down our throats. With a five-year solo dynasty running, we should have been swimming in June Mar merch and binge-watching his online talk show with Marc Pingris. We should have been blessed with about two or three June Mar films. But that’s not the kind of star he is. June Mar is not a brand. 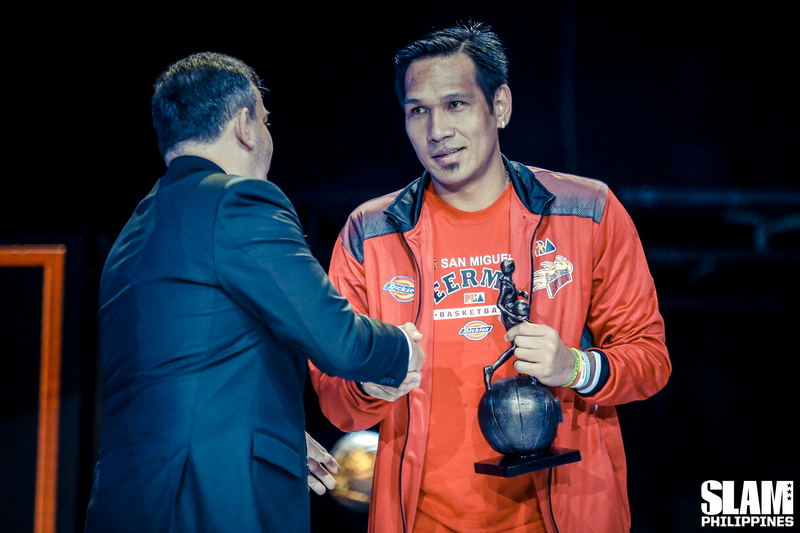 June Mar has transcended talk of, “Is he going to win MVP?” Because of course he is. The talk he’s part of now, the conversation that requires a June Mar mention, is that of greatest of all time. Which, of course, the humble, five-time MVP won’t take ownership. “Para sa akin, hindi ‘yung MVP ang basehan kung ikaw na ba ang pinakamagaling sa lahat. Para sa akin, kung ano ‘yung na-contribute mo sa league,” he said, in front of reporters after paying tribute to his parents, unwittingly describing himself as the greatest. What June Mar has contributed to the league (can you believe he’s only in his seventh year as a pro?? ), aside from the 20 points, 12 rebounds per game, is his character. What makes June Mar the MVP are the undisputed stats and his infallible likability. What can make him the greatest of all time is, stripped of everything, who June Mar purely is. Being the GOAT, a term loosely thrown around nowadays, isn’t hinged solely on the numbers. It’s also about the struggle. And June Mar’s story of making it in Manila, holding together a powerhouse San Miguel squad (not an easy task), and carrying on his broad shoulders the role of a constant, composed, immovable, solid force in Philippine basketball without a hint of braggadocio, those are the things that make him great. Being the PBA’s greatest of all time is nice. But it felt like the bigger dream is for a son to make his parents happy. After Sunday, mission accomplished.